Stop the Assault on Public Education! MARCH 4 – Across the country, public education is under attack. Last fall, the University of California ordered a whopping 32 percent increase in student “fees.” UC faculty and staff held a one-day strike in September. A three-day system-wide strike in November joined with angry student protests and occupations. A one-third increase in the cost of attending college is not a tuition hike – it’s a purge. A class and race purge, because large numbers of poor, working-class, black and Latino students will be pushed out of school. In New York, the same thing is happening – only in slow motion. Last year, the Democrats in Albany rammed through a 14 percent tuition increase. This year, Governor Paterson has a bill to allow the CUNY Board of Trustees to raise tuition annually, beginning with an increase of up to 10 percent this year! Think you’re going to cover the increase with TAP financial aid? Think again – Paterson’s budget calls for a $75 per student cut in the Tuition Assistance Program. Democrat Paterson’s budget calls for $84 million in cuts to CUNY senior colleges, and $285 per full-time student at the community colleges. Republican mayor Bloomberg’s budget calls for $25 million in additional cuts to community colleges. All this despite a record increase in CUNY enrollment. Altogether, Paterson wants to slash $2.7 billion from education and health care, while Bloomberg is threatening to cut 2,500 teachers’ jobs, and lay off 18,500 city workers. To top it off, the Metropolitan Transit Authority, that den of real estate speculators and experts in double-entry bookkeeping (in their case, two different sets of books), are filling a “newly discovered $400 million budget gap” by ordering 1,000-plus layoffs of transit workers, including 500 station agents, and canceling public school students’ free Metrocards. The cuts target every section of working people, while the bankers award themselves $150 billion in bonuses. Bottom line: the budget cuts and tuition increases affect YOU. Thousands of CUNY students could be forced to drop out. California education unions, students, faculty and staff have called a March 4 national “Strike and Day of Action to Defend Public Education.” In New York, CUNY and SUNY students along with faculty and teachers unions (PSC, UFT) are protesting outside Governor Paterson’s Manhattan office, then marching to MTA hearings. The time for labor and students to act is now. All out on March 4! BUT to effectively fight the assault on public education, it is essential to understand where it is coming from, and what are the forces that can defeat it. As in every serious battle, we have to know who are our friends, and who is the enemy. To begin with, we are in the middle of the most serious economic bust since the Great Depression of the 1930s. The attacks on public education are part of a broader offensive to make workers pay for the capitalists’ crisis. Another key factor is that the U.S. is mired in an imperialist war. Washington doles out trillions of dollars to shore up Wall Street banks, while spending hundreds of billions to bomb Afghanistan, Iraq, Pakistan and elsewhere. Once again, various leftists repeat their slogan, “money for education, not for war.” Unions and student governments send caravans to Albany to beg for “investment” in education. Won’t happen. Why not? Because it’s not a matter of budget priorities, but of fundamental ruling-class interests. The labor-initiated call for the March 4 actions says, “We can beat back the cuts if we unite students, workers, and teachers across all sectors of public education.” A second call for a “National Day of Action to Defend Education” by student and leftist groups appeals vaguely to “Take a Stand for Education!” While referring to the economic hard times, both calls ignore the fact that this is a crisis of the capitalist system. What will decide this fight is not pressure politics but power. A day of action uniting education workers – or two, three, many days of protests, marches and walkouts – would still be far from enough to do the job. Moreover, the whole approach of building a “movement” on a lowest-common-denominator platform is aimed at winning the support of capitalist politicians, who can make a meaningless gesture “for education.” In New York, one of the invited speakers is Democratic city councilman Charles Barron. And a slew of calls, press releases and statements by organizers of the March 4 Day of Action studiously avoid a vital fact: the assault on public education comes straight from the top, from the Democratic Congress and Democratic president Barack Obama. To defeat the attack on public education will take the power of a mobilized working class, politically prepared to take on the capitalist ruling class. 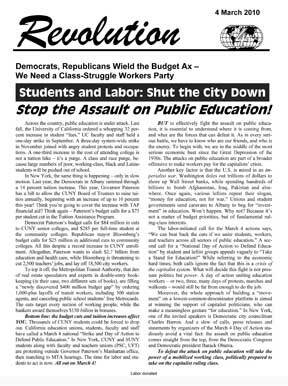 The capitalist attack on public education is not just because of the recession/depression. It’s also the result of a worldwide drive for privatization. In the late 1970s international financiers and money managers realized that their profit rates were declining. A drive to “open up” the Soviet Union and East Europe to capitalist markets offered a new area for exploitation. Ripping up unions allowed them to lower wages and raise the rate of exploitation. And education could be turned into a new profit platform. Vendors of “educational services” are making out like bandits. Outright privatization was tried, like Edison Schools Inc., but didn’t produce the desired return on capital. So they opted for semi-privatized “charter schools.” Hedge fund billionaires love them. In exchange for some tax-deductible seed money, investors get access to a steady cash flow of tax dollars. In higher education, raising (or introducing) tuition is the name of the game. So following the guidelines for “market-oriented” higher education, the Mexican government signed on a World Bank loan of US$180 million, stating that: “The increase in coverage can only be accomplished if the institutions of higher education are able to generate additional income, and if the private universities are able to absorb an increasing share of higher education enrollment” (quoted in Marxism and the Battle Over Education (2d edition), a special supplement of The Internationalist, January 2008). The attempt to introduce student “fees” in 1999 set off a massive strike by the quarter million students at the National Autonomous University of Mexico (UNAM), lasting ten months. Our comrades of the Grupo Internacionalista played an important role in the strike, sparking a worker/student defense guard to defend the campus occupation. Although the strike ended with the mass arrest of 1,000 students, the attempt to make students pay for university education was defeated. The same forces are at work here. Six years ago, University of California executives promised BNY Mellon, a Wall Street bank, that they would jack up tuition in exchange for billions of dollars in loans to finance a construction spree. In early 2009, UC took on $2.15 billion in tuition-backed loans. Interest alone on these newly contracted loans would amount to more than half the $170 million in “savings” from furloughs imposed on university employees last year. And in November, the trustees fulfilled their promise to the banks by hiking tuition. It’s not just about money. Higher education, and the rest of the school system, is being aggressively resegregated. As a result of the elimination of affirmative action, ordered by the U.S. Supreme Court, less than 4 percent of students enrolled at the University of California are black. At CUNY, education used to be free – until the lily-white institution was opened up to minorities and working-class students via open admissions following the 1969 CCNY occupation. Ever since then, college administrators and capitalist politicians have repeatedly raised tuition. In 2001, amid the war frenzy accompanying the U.S. invasion of Afghanistan, CUNY ordered “undocumented” immigrant students to pay out-of-state tuition. CUNY Internationalist Clubs grew out of the struggle that partially thwarted this racist attack. At the same time, public schools are being closed and invaded by non-union charters. The program is carried out by billionaire mayor Bloomberg and his schools chancellor Joel Klein,.but they are backed to the hilt by the White House and Congressional Democrats. Obama’s “Race to the Top” scheme demands that states allow more charter schools if they want federal education funding. What this means is that education entrepreneurs are running “public” schools like a private real-estate investment trust (REIT). The Village Voice (23 February) recently profiled one school, PS 198/PS 77, that is literally cut in half by a color line: black and Latino students and their teachers are forced by police to go in the back door, while white students get out of their limos to enter the front door in a separate school for the “gifted”! The “gift” here is money. We have denounced this charter school invasion as “educational colonialism.” Class Struggle Education Workers, a union tendency in the UFT and PSC, has actively fought to “Stop racist school closings.” The ordered closing of a score of public schools, including many of the largest high schools in the city, has sparked an outcry among black and Latino students and parents, which exploded at a January 26 hearing of the mayor’s puppet education panel. What’s needed is to galvanize the anger into a powerful class force that can defeat the privatizers and budget ax murderers of public education. 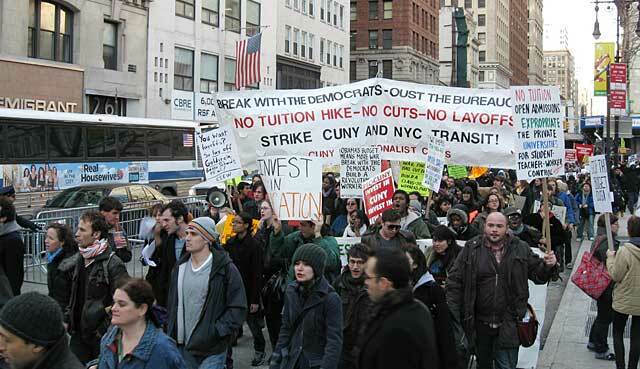 A year ago, on 5 March 2009, as 75,000 teachers, municipal workers and students took to the streets against threatened cuts, the CUNY Internationalist Clubs chanted, “Students and labor, shut the city down!” This call was taken up by hundreds of CUNY students. This is not an “academic” matter: a citywide strike by a major union could stop the Wall Street budget hackers in their tracks. The 2005 transit strike showed that we have the power. It was defeated because the transit workers were left to hang alone by the NYC labor movement, and because the union leaders are beholden to the Democratic Party. It was the Democrats in Albany who had courts and cops enforce the Taylor Law, ordering prison and crippling fines for strikers. Today, Obama pushes the corporate education “reform” program of “merit pay,” charter schools, attacks on teacher tenure. He has now endorsed the firing of all teachers and staff at a Rhode Island school. At the time of the 2008 elections, the bulk of the reformist left (including the International Socialist Organization, Workers World Party and others) sought to promote the false “hope” in “change” from the popular new president. See also: No Police State at Hunter College!